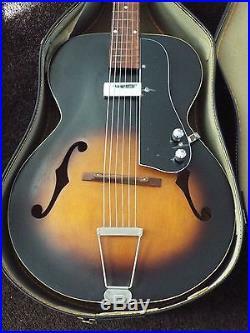 This is a replica PICKGUARD which is similar to a Gibson L48 Archtop from the 1930s and up with no cutaway. It will also work with Harmony Mastertone guitars. LISTING IS FOR PICKGUARD ASSEMBLY ONLY, NOT GUITAR. 5/8 INCH CLEARANCE IS NEEDED BETWEEN STRINGS AND TOP WHEN STRINGS ARE FRETTED DOWN AT THE 12TH FRET. Guard shown is Picture is of Mastertone or L48 Guard but slightly wider. Clip on tuner with battery or 10 foot high quality guitar cable. It has been modified and drilled for. Available in 3 ply tortoiseshell acrylic (t/black/white), black/white/black, solid black, solid white, or some pearloids. Black, grey, mint, blue, white. VINTAGE TRANSLUCENT TORTOISESHELL MATERIAL IS AVAILABLE, WHICH REPLICATES THE CELLULOSE NITRATE MATERIAL USED ON VINTAGE GUITARS. YOU GET A CHOICE OF SEVERAL DIFFERENT TYPE GUARDS OR MATERIALS. Rear of guard is covered with foil and this darkens the guard and shields the unit from 60HZ interference. Volume and Tone controls are 500k Ohms mini pots with 18 spline shafts and push on knobs. 047mfd (new type) and there is a grounding wire for connection to the tailpiece. Jack is mounted to the guard and wire for connection to tailpiece included. Bracket is custom angled bracket and guard has been drilled for mounting holes and countersunk. Shielded cable, Mini humbucker with 7K ohm impedance. This will electrify your archtop without drilling holes in the top. Jack can be supplied mounted to the guard at no extra charge. The item "Harmony Archtop Guitar Pickguard Only. WithPickup, Controls, Jack, Hardware Fits Many" is in sale since Friday, November 16, 2018. This item is in the category "Musical Instruments & Gear\Guitars & Basses\Parts & Accessories\Guitar Parts\Pickguards". The seller is "patboat11" and is located in Huntington Station, New York. This item can be shipped worldwide.